When one thinks about the Algarve, it’s inevitable thinking of beautiful images of gorgeous white sand beaches and warm clear waters… The sunshine and clear blue sky, whitewashed houses with their terraces and chimneys. 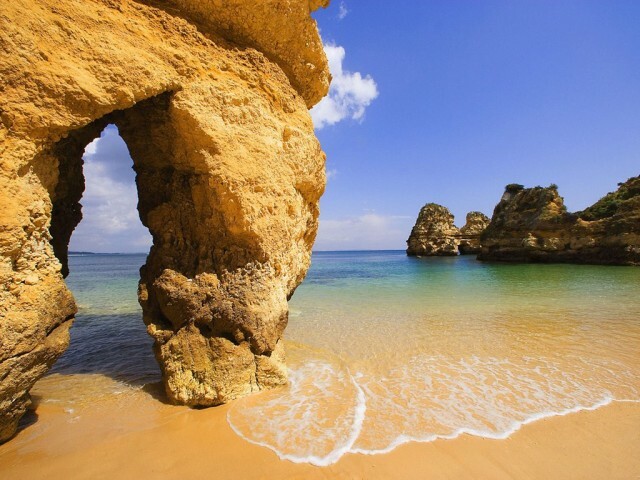 Algarve is the southmost region of Portugal, washed by the Atlantic Ocean, and it’s all about sunshine all year round and top quality sandy beaches preserved by Nature. Algarve is a perfect holiday or vacation destination, an year-round sunny weather boasting temperatures between 20ºC and 30ºC on average, makes the Algarve an ideal spot for sports enthusiasts like golf, tennis and swimming. The immense coastline with fantastic sandy beaches offers a perfect scenario for all kinds of water sports. So here is a nice list of enough strong reasons for visiting the Algarve region. Tavira is one of the most beautiful towns in the Algarve, also one of the few towns that preserves its architectural origins. Tavira is located around 30 Km East of Faro, the picturesque town is known for its historical culture and unspoilt white sand beaches, typical roofs and chimneys, beautiful views over the Gilão river and its Roman bridge. Tavira is the city with most churches in the Algarve, it has around 28 magnificent churches and chapels, a very high number for such a small town. Check our Tavira Guide for more about this amazing town. Parque Natural de Ria Formosa it’s one of the major tourist attractions of Algarve, located between Manta Rota and Vale do Lobo in south of Portugal. The Park is a National protected area of unspoilt marshlands, freshwater lakes and lagoons filled with a unique range of local wildlife. A place where you can admire the fauna & flora characteristic of the Algarve region. Albufeira a peaceful traditional fishing village, is now also a leading tourist resort of Algarve. It is famous for its beaches, golf courses, restaurants, bars, discos, and vibrant nightlife. Notable beaches are – Gale, Coelha, São Rafael and Vigia, Baleeira, Albufeira, Oura, Balaia, Maria Luísa and Olhos de Água, and Falésia. Notable golf courses are – Salgados, Pine Cliffs, and Balaia Golf Village. Carvoeiro is a lovely coastal village and a great tourist center, located in the area of Lagoa, in the Central Algarve. The lively and friendly fishing village has a nice sheltered beach that is good for snorkelling. The coastal village is famous for its wide range of restaurants and bars. It is a popular venue for free live entertainment shows. Castro Marim is a charming town and municipality in the southern region of Algarve. Featuring dusty gold of soft sand, the turquoise blue of warm waters, the town has three main beaches – Alagoa, Verde/Cabeço, and Retur. It also offers vast ranges of hills full of wild flowers, and serene countryside along the banks of the Guardania, lush with orchards and vegetable gardens. Faro is your sunny destination all year round. It is a popular place for sun-seekers. The white-washed town is known for its colonial and Moorish-influenced architectures and museums, such as Cathedral, Nossa Senhora da Assuncão Convent, São Francisco Church, Infante Dom Henrique, and Regional Ethnographic museum. Monchique is an attractive mountain-top village in southern Portugal, in the district of Faro. It is a fantastic health-resort, finely situated among the wooded heights of the Serra de Monchique. The lovely village is famous for hot sulfur springs, with baths; it has a delightful natural thermal spa famed since Roman times. Praia de Odeceixe is a lovely sheltered, crescent-shaped beach in South Portugal. The place is a virtual paradise for surfing. It is a reliable surfing destination where you can enjoy surfing at any time of the year. The beach rarely gets packed, even in the height of the summer. Algarve Cuisine offering an immense range of delicious regional dishes, is also one of major reasons for visiting the region. You can check out the regional specialties, such as seafood soups oregano snails, pork meat and “cataplana” clams, roasted dried octopus on the grill (Lagos style), and grilled squid and cuttlefish. And, don’t forget to taste the fig pastries, marzipan pastries, “D. Rodrigo” and “Morgado” from Tavira, puff pastries from Olhão, and almond paste and caramel pastries from Tavira. Algarve Golf facilities are one of the finest in the world. Algarve really is a perfect destination for golf vacation. You can really find a large number of top class golf courses in the city. Some of the notable golf courses include Parque da Floresta, Boavista, Palmares, Álamos, Alto Golf, Gramacho, Morgado, Penina Academy, Silves Golf, and many more.